What’s so frightening about El Sicario isn’t that it’s so shocking in its details of drug war violence. 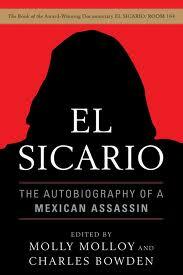 The humanity of this “Autobiography of a Mexican Assassin” stays with you more than its inhumanity. The chronicles of the unnamed sicario (common term for a hitman in Latin America), as related to Molly Molloy and Chuck Bowden, include graphic detail of killings and torture. But we have already seen and heard much of it. Over the past four years, there has been no dearth of images and reports of the horrific violence that has besieged many parts of Mexico. Graphic photos and video of mutilations and torture sessions are readily available on the internet. If you missed all that, border law enforcement officials and the Border Patrol are busy presenting slide shows of the violence in schools and other public venues to warn about the consequences of drug use. But what sticks with you after reading El Sicario (Nation Books, 2011) are not the horrors and magnitude of the drug-related violence in Mexico but the humanity of the story – how easily and understandably a person could become a killer for drug money. That’s truly frightening given the extent of the illegal drug market in the United States and Europe and its deepening penetration of less developed countries like Mexico. He recalls his boyhood in a Juárez colonia – the special day at the circus with his dad – and his early dream of escape from poverty to a life of wealth and power. Easy money for smuggling drugs into El Paso led to a deeper involvement in the drug trade, along with the allure of favors of women, drugs, and spending money, especially after he agreed to enter a police training academy under the auspices of the drug trafficking organizations (DTOs). By helping this repentant killer tell his story, editors Molloy and Bowden offer the reader what is truly an inside story. In the telling, this sicario helps us understand how the hopes and dreams of a young man from Juárez can turn to a life of professional killing. It’s an insider story that provides an unusual window into the political economy of Mexico and its intersection with the drug market, both in Mexico and across the border in the United States. It wasn’t that he was born a criminal, raised in a dysfunctional family, born evil. Rather he was at heart a consumer who, like most of us, wanted more – and the multi-billion dollar drug trade created by drug prohibition let him have it. Living in exile in the United States, the sicario looks back across the border with deep pessimism. Although he occasionally expresses sympathy for the government’s campaign against the cartels, this reformed assassin more often describes a political and criminal justice system that is thoroughly corrupt and compromised. God, the United States, and a handful of uncorrupted journalists and government prosecutors (generally killed off) offer the only possible paths to salvation and hope. Disgracefully, everything in that country is evil. There is so much corruption that it can have no end, no matter how much help Mexico gets from other countries. Sadly, desgraciadamente, all of our law enforcement academies in Mexico – the different police forces, the investigative police, the military police, and the army – have been used by the narco-trafficking organizations as training grounds for their future employees. Who has the power? Try to imagine who has the power in this kind of government. When all of the open spaces, the back roads, and the streets are guarded and patrolled by the Army. So, who is allowing all of the drugs to pass? The killing fields of Mexico, according to the sicario, are mostly unreported and undiscovered. In his opinion, it is often only when the DEA tracks the whereabouts of its informants that the mass graves are uncovered. I think that here in the border region, that…well, let’s say that if there are one hundred of these narco-fosas [narco-graves], maybe only five or six of these places have been discovered. Within what Howard Campbell calls the “drug war zone” (in his book by the same name), the sicario describes a breakdown in cartel control and the rise of “imitators” without the traditional “professionalization” and “codes” that once guided the work of cartel assassins like himself. There are no more real codes [such as not killing women and children] no more rules in business. Before, the different cartels that were working in the country respected the codes and arrangements that had been established. Now, there are no codes, they are all lost. Inter-cartel violence isn’t the only explanation for Mexico’s recent drug-related violence. “Times have changed,” he says. The leading drug trafficking organizations have also been killing the “punks” that he says are imitating the cartels and have also branched into non-drug crimes like car thefts. Compounding the problem is the rise of domestic drug trafficking and consumption of crack, cocaine, and methamphetamines. “Mexico has now passed from being an exporter and transporter of drugs and is now a consumer country,” he observes. As the U.S. reinforces its border, the introduction of drugs into the United States is decreasing. So the narcos now are trying to addict the children in the schools in Mexico. They are now working to hook people who work in the maquiladoras [factories]. And they are recruiting women to distribute drugs. The sicario’s new world view is shaped more by moral imperatives (good and evil, temptation and redemption) than by policies and markets. This is a worldview consistent with Washington’s own morally-driven drug war and drug prohibition policies. Like many U.S. analysts, the sicario worries that a window of opportunity to crush the cartels may be closing as the Calderón sexenio draws to a close. I think that the United States law enforcement needs to take advantage of the Calderón government, because he will allow them to do whatever investigation they want. Many other governments will not allow them to go so far. Another government will not allow the same cooperation and availability of their military to work with the United States. The United States needs to take advantage of this situation. It wasn’t the opportunity write another headline story in the attention-grabbing drug war in Mexico that brought Molloy and Bowden to the sicario and his story. In their respective introductions to the book and in their respectful editing of his story, Molloy and Bowden exhibit an interest in getting past the headlines to the fundamental truths of the drug trade and to the politics and economics that foster it: how easily dreams and ambitions can lead to violence and evil when surrounded by an immensely profitable international illegal drug market. In El Sicario and in other books and journalism, Bowden has taken us to the heart of Juarense darkness. Bowden’s reputation brought him to the attention of this sicario, who tells his story both as part of his new redemptive path and in the hope that his story may help end the violence and evil of the drug trade and drug war. Once again we are in debt to Bowden for helping us understand the borderlands and the border drug world -- not just through his reporting but also by way of his often stunning insights and frank reflections. But here, as in such other of Bowden’s works as Murder City: Ciudad Juárez and the Global Economy’s New Killing Fields and Juárez: The Laboratory of Our Future, there are instances of analytical overreach, when impressions turn too quickly to provocative -- sometimes dubious -- generalizations. For those who follow the scourge of the drug war and know the corruption of Mexico’s political economy, some of Bowden’s generalizations and declarations resonate and often affirm our own inchoate but perhaps less dramatic assessments. Bowden certainly has earned the right over his many years of reporting about the border to say what he believes and to share his worldview with us. We credit him for daring to reach into the complexities of the border, immigration, and Mexico for the back-story. In the preface, Bowden once again articulates his conviction that the violence and social disintegration of Juárez are emblematic not only of the drug war, but also of the global economy – the murder city as the laboratory of our globalized society’s future. He sees Juárez as a manifestation of an emerging Mad Max world created by a heartless global economy that alienates the individual, erodes ethical foundations, and destroys collective identity. In this world, the statements of American presidents about Mexico mean nothing because they insist on a Mexico that does not exist and that has never existed. Such provocative writing sets us searching for underlying meanings and forces behind Mexico’s drug violence and reminds us that official truths are usually lies. We pause to reflect after reading Bowden, which is his special contribution to the Mexico drug war discussion. We are grateful for this challenge to reflect and reconsider. But questions need to be asked about the degree to which Bowden’s own answers reveal truth and reality. “The sicario takes us to the real Latin America, not a place of magical realism, but a place of murderous realism.” Yes, perhaps for those who see Latin America with rose-colored glasses as a land bursting with tropical color, joyful living and solidarity, there may be a need for a closer look. But whatever the meaning of “murderous realism,” the phrase is a stylistic and analytical step much too far – a deliberately vague generalization that distracts and does little to help us understand Latin American politics and people. In some ways the book reminds me of the Illiad, a self-contained strange world that by its very existence upends all the lies and assumptions of our world. In the Illiad humans are toys for the gods’ pleasure. In this book humans are toys that are tortured and murdered by unseen forces wearing the mask of the Mexican state. Bowden rightly insists that the violence in Juárez cannot be understood without recognizing the central role of the state not just as drug warrior, but also as drug trader. In his writing about the border, he also rightly points out that the violence in the streets of Juárez and at the hands of the sicario he interviews cannot be fully understood apart from the anomie and economic ruthlessness associated with the city’s maquiladora economy. But, where is the evidence that this is the future of all communities integrated by outsourcing into the global economy? There are many evils in the global economy, surely, but gang violence, killing for hire (as the origin of the term sicario itself remind us), and epidemic social violence predate recent globalization trends. No doubt that corruption and trafficking are widespread within Mexican security forces. But the putative equivalence between the state and the shadowy criminal underworld – “wearing the mask of the Mexican state” – tends to obscure at least as much as it helps illuminate the complexities of Mexico’s political economy. Clearly the alienation and social disintegration related to the outsourcing development model embraced by Juárez should not be ignored. But it’s the city’s political geography as a border city and traditional smuggling corridor that are fundamental to its status as a “murder city,” not its role in the new global economy. It could be argued that all such crossroads where complementary dimensions of the global economy meet will all give rise to the same reality and evil -- which is what Bowden seems to imply. But this doesn't always hold true. Nor, of course, is this type of routine killing and gang violence limited to the nexus points of the global economy. It’s not Bowden’s job, of course, to undertake comparative studies about the pervasiveness of cultures of murder and hopelessness in cities penetrated by the global economy’s outsourcing. Yet Bowden’s habit of conflating the global economy, mindless killing, and social despair in support of overly broad and ahistorical conclusions about “our future” and the global economy tend to undermine the essential integrity of his work. Certainly, whatever connections exist between the maquiladora economy and drug violence merit our attention. Juárez may serve as a “laboratory” where these connections form and where they can be observed. Yet there is a danger of extrapolating without evidence and in the process leaving us with an even more superficial understanding of both the global economy and the illegal drug trade. While less provocative, Molloy’s introduction is more helpful in understanding the reality of the drug world and Mexico. For those concerned about the policies and forces behind the drug war, Molloy’s introduction and details of the autobiography offer relevant information and insight about the structures of the drug trade and drug war. Molloy, who monitors murders in Juárez on the Frontera List, disputes the common view that the surge of violence in Mexico is limited to those like this sicario who are the “soldiers” of the drug trafficking organizations. Molloy and Bowden deserve our appreciation and respect for giving this ex-assassin the opportunity and freedom to tell his own story -- from his memories of mole sandwiches as a young boy on a family outing through his accounts of torture and killing as a routine drug trade practice to his reflections as a reformed and saved evangelical Christian. His story, apparently unscripted by the editors, gives us an inside glimpse not only into a largely hidden underworld but also into the mind and heart of a soldier in the drug trade. What are the policies, principles, and beliefs that will bring the drug trafficking organizations and their imitators under societal control? Neither the editors nor the sicario offer a prescriptive agenda. However, by helping us understand the complexity and forces that shape this drug trade underworld, we are certainly on better footing to evaluate such issues as border security, drug prohibition, Mexico’s drug war, and Washington’s own four decades of counternarcotics aid and intervention. many thanks for this illuminating and thorough review. Very insightful reflections that add much more value to the book itself.